Type 1 diabetes (T1D), sometimes referred to as autoimmune or juvenile diabetes, results from the pancreas’ failure to produce enough insulin, causing disruption to blood sugar regulation in the body. The disease cannot be prevented and requires lifelong monitoring of blood sugar, and daily insulin injections, in order to prevent serious long-term complications, such as blindness, stroke, kidney failure and cardiovascular disease. “For some patients, pancreas transplantation maybe an option, but there are significant risks, and the surgery often involves specialized care in the ICU (Intensive Care Unit) and a hospital stay that could be as long as a month,” says Dr. Steven Paraskevas, Director of the Pancreas and Islet Transplant Program at the MUHC. 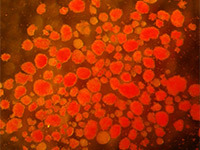 The infusion of islets – the clusters of pancreatic cells that produce insulin – is a non-surgical technique that is being explored in some academic medical centres as an alternative to the transplantation of the whole pancreas organ. 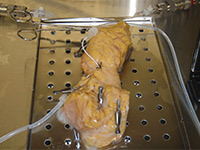 “As the procedure is minimally invasive, it represents an incredible improvement for patients, as well as the healthcare system, through reductions in risk and infection rates, improved recovery time, and hospital stays measured in hours to days, rather than weeks,” says Dr. Paraskevas, who is also an Associate Professor of Surgery at McGill University. For patient, Zohra Nabbus, from Pointe Claire, Quebec, life with type 1 diabetes had become increasingly challenging. After kidney transplantation and unsuccessful pancreas transplantation, she was suffering more frequent episodes of hypoglycemia. “It had got to point where I couldn’t be left alone anymore, so when I heard that islet cell transplant had been developed at the MUHC, there was no doubt in my mind that I wanted to be a candidate,” she said. The procedure began in May at the Human Islet Transplant Laboratory where islet cells were separated from a suitable donor pancreas – a delicate process that has required years of investment in technology and medical expertise. Two days later, the isolated islets were infused into the patient’s liver through a small catheter in the abdomen, without the need for surgery. 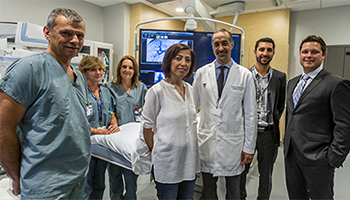 The entire procedure was conducted in the interventional radiology suite at the Glen site of the MUHC. The pancreas is perfused with an ice cold enzyme blend, under controlled pressure and flow settings, prior to digestion. Copyright MUHC Human Islet Transplant Laboratory. (> 95% purity) isolated by the MUHC Human Islet Transplant Laboratory, as seen under the microscope. Copyright MUHC Human Islet Transplant Laboratory. “Transplant Québec welcomes the experienced team at MUHC, led by Dr Steven Paraskevas, and is delighted that Quebec can count on the Human Islet Transplant Laboratory in providing innovative treatment to patients whose health and quality of life will be greatly improved. We will continue to be at the forefront to support the work of the Laboratory as we have done in the research phase. This collaboration is at the heart of the mission of Transplant Québec, which coordinates organ donation in the province of Quebec,” acknowledged Louis Beaulieu, CEO of Transplant Québec. Islet cell transplantation is currently considered a novel therapy in Canada, and has been assessed for expanded use by the MUHC’s Technology Assessment Unit (TAU), as well as the FDA (Food and Drug Administration) for approval in the United States. 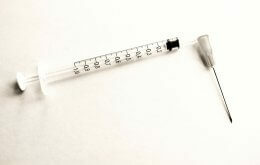 The procedure is already a recognized therapy for diabetes in the UK and Europe. There are approximately three million people afflicted with diabetes in Canada, over 300,000 of which have type 1 diabetes. Support for this project was provided by The Royal Victoria Hospital Foundation, The Montreal General Hospital Foundation, the Research Institute of the MUHC, Transplant Quebec and the Canada Foundation for Innovation.